Split kids up into 2 teams. Give each team a bucket of water and a sponge. Across from each team set up different sized containers (cup, liter, gallon -also can include- pint, quart, half gallon) in a line. 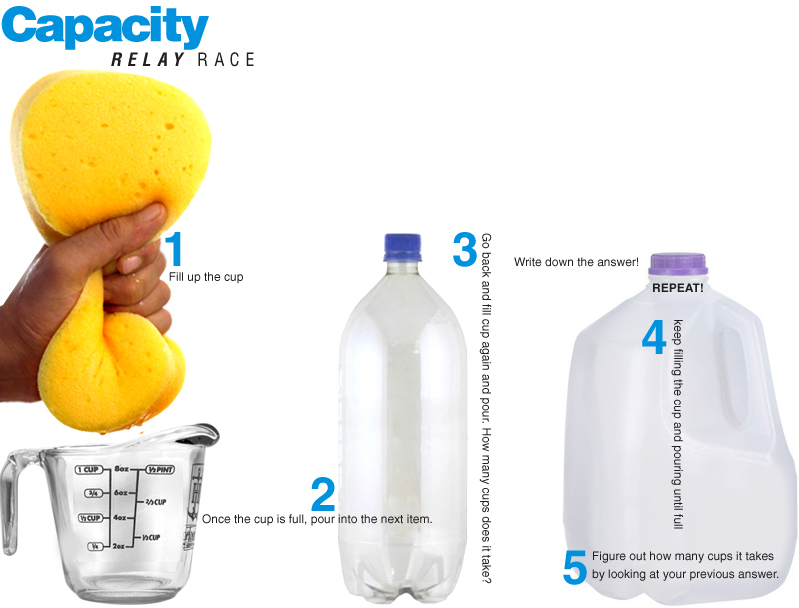 Kids within a team take turns racing to fill a gallon of water! First, they must fill up their cup by dipping the sponge into the bucket of water and squeezing the water out into the cup. Once the cup is filled, they dump it into the next item. The item won't be filled after a single cup. So, the next team member races to fill up another cup. Once the bottle is filled, they write down how many cups it took to fill the bottle. Then, they dump it into the next sized container. The water won't fill up the container. They have to start racing to fill up a cup again and figure out how many cups will fill up this container. The winner is the first team to fill up the last, largest container and have the correct answers written down (how many cups are in each container)!